What this lays bear is that an internal culture of shortchanging natives established itself inside the actual ministry of Indian Affairs and that no champianship for natives was ever allowed or promoted. Correction was as easy as getting a champian involved because none of this behavior would have ever stood. White voters would never have accepted this behavior let alone Indian voters. So yes this spells out what happened and why we have had a serious lag in Native outcomes. Yet this same report effectively creates champians with the tools able to change it all. It is not hard at all to ensure comparable resources become available. The worst is that this was never deliberately mandated but was never properly recognized as well for the level of damage been created. Somewhere there was a severe lapse in imagination..
Against all odds, the Canadian Human Rights Tribunal decided in favor of First Nations and issued a decision that not only highlighted the blatant discrimination faced by First Nation children and families, but also exposed the Canadian government's shameful conduct. Last week's ruling exposes the Canadian government's conduct does not live up to the spirit of reconciliation with First Nations. Eight years ago, a human rights complaint was filed at the Tribunal which alleged that the federal government has discriminated against First Nation children and families for the last 148 years by providing them with less funding for child and family services than Canadians. This case gained a great deal of attention because of the many attempts by Canada's Department of Justice officials to have the case tossed out, prevent the media from reporting on the case, and to spy on and intimidate the complainant. Given the lengths to which the government tried to prevent the case from being heard, it was clear this case could be a game changer for First Nations. - Indigenous children spent over 66 million nights away from their families in foster care since 1989. Blackstock and her researchers and legal team persisted until they had their smoking gun – Canada's own documents which supported their case. After many legal barriers, Blackstock's team were able to obtain tens of thousands of internal federal documents which fully exposed Canada's culpability. Numerous reports and advice provided to ministers confirmed that one of the factors which led to the over-representation of First Nation children in foster care was Canada's failure to properly fund child and family services on reserve. In fact, one document reported "circumstances are dire" and that inadequate resources would force child and family service agencies to close down and even worse - that the rate of child apprehensions had increased. The government's funding formulas "are structured in such a way that they promote negative outcomes for First Nations children and families, namely the incentive to take children into care." Yet despite being aware of the thousands of children being ripped from their families due to their discriminatory funding formulas, Canada failed to act. The Human Rights Tribunal found that the federal government's funding of child and family services for First Nations agencies on reserves, through the First Nations Child and Family Service program, was in fact a "service," "assistance," or "benefit" that was supposed to be funded at levels reasonably comparable to the provinces. While it may delegate the delivery of the service to provincial or First Nation agencies, the federal government retains the constitutional responsibilities and special fiduciary responsibilities to First Nations. The complete discretion held by the federal government over this program is supposed to be in the best interests of First Nations children, but was not exercised as such. Their concerns were more related to reducing costs and saving money, than to the best interests of the children. As a result, the First Nations children and families on reserve paid the ultimate price. The Tribunal found that First Nations were discriminated against to their detriment on the basis of their "race and/or national or ethnic origin" – i.e., that they were First Nations people. 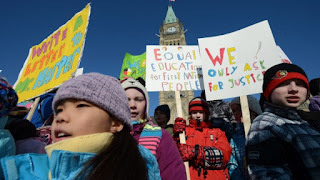 The Tribunal found Canada's evidence, arguments and positions to be "unreasonable, unconvincing and not supported" and fully acknowledged "the suffering of those First Nations children and families who are or have been denied an equitable opportunity to remain together." It also recognized those who had been adversely impacted by Canada's past and current child welfare practices. In terms of a remedy, the Tribunal ordered Canada to cease its discriminatory practice against First Nations children and to take immediate measures to redress and prevent it. They were specifically ordered to reform their child welfare program in accordance with the direction provided in the Tribunal's decision. Submissions on further remedies are yet to be made and additional orders may be made in the future. This is the acknowledgement that First Nations have waited for, for a very long time. While all of the research, reports, statistics and even United Nations studies had made similar findings, it took an actual court case to fully expose Canada's discriminatory practices and disastrous impacts of First Nations. The order to remedy the discriminatory under-funding of child and family services on reserves is just the tip of the iceberg. This case could have far-reaching consequences as Canada's discriminatory funding models also negatively impact housing, fire protection, policing, water and sewer services, education, health and social services on reserves. Canada's entire discriminatory relationship with First Nations is now under the microscope - this is an long overdue development. We can't get ever achieve real reconciliation between Canada and First Nations, as envisioned by the recent Truth and Reconciliation Report on Canada's residential schools, without first exposing the truth. Reconciliation requires Canada to accept responsibility for its actions and take steps to implement the CHRT's order. However, an appeal of the decision would mean that the Liberal Government, under newly elected Prime Minister Justin Trudeau, was not sincere in their commitment to reconciliation and their pledge to forge a new relationship with Indigenous peoples.